over sixty thousand inhabitants in north-west England. with Musical Director Deborah Milledge (centre) and Accompanists Sue Quarmby (left) and Margaret Harrison (right). Our choir performs around sixteen concerts a year for charities, church groups and other fund raisers. We are frequently hired to sing at weddings and funerals. Our annual concert raises money for our own funds which enables us to buy new music, uniforms etc. Many local businesses sponsor us and we also enjoy support from local councillors (of all shades). 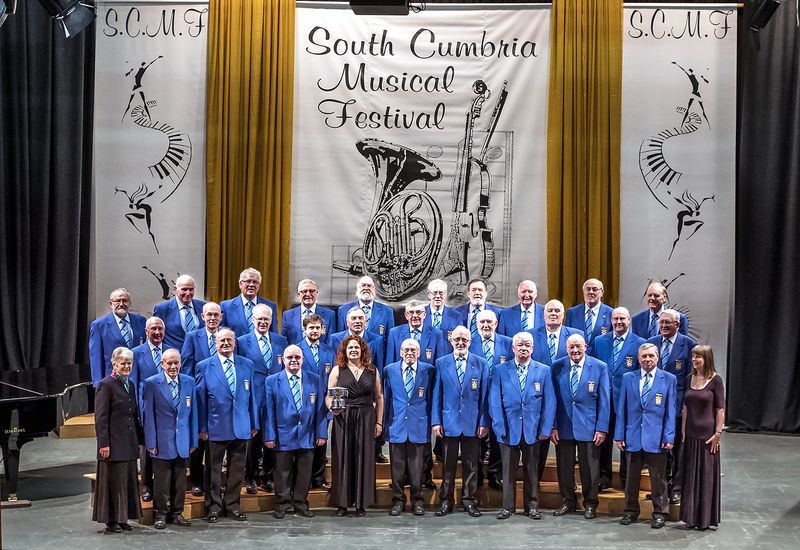 Individuals or organisations wishing to arrange a concert should contact the Choir Secretary in the first instance: they may find it helpful to print out the form here. Alternatively you may email the Secretary - please ensure that all the relevant particulars requested on the form are included. Contact Webmaster (for website queries and general enquiries. his baton and resumed his place in the bass section of the choir. As a mark of our appreciation he was appointed a life member. sad and unexpected death in February 2017. Mrs Deborah Milledge. was subsequently invited to succeed her husband in the role.